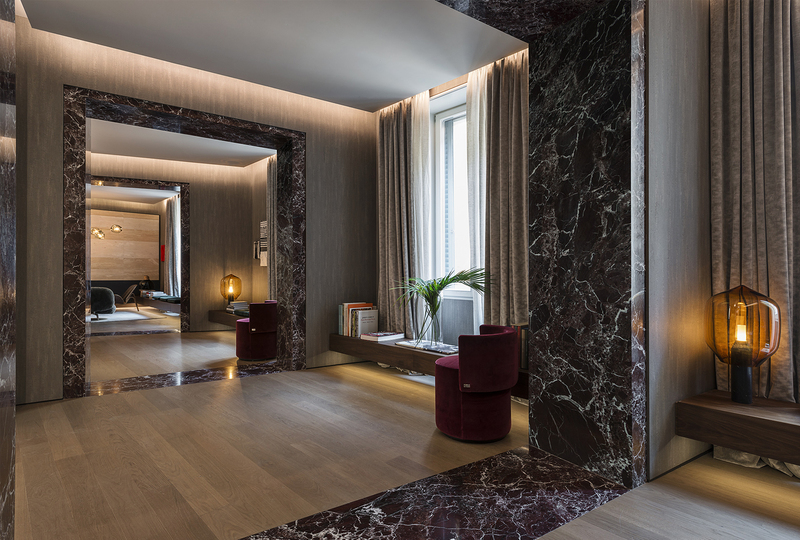 The third floor of the Palazzo FENDI has been transformed into the very first FENDI hotel. 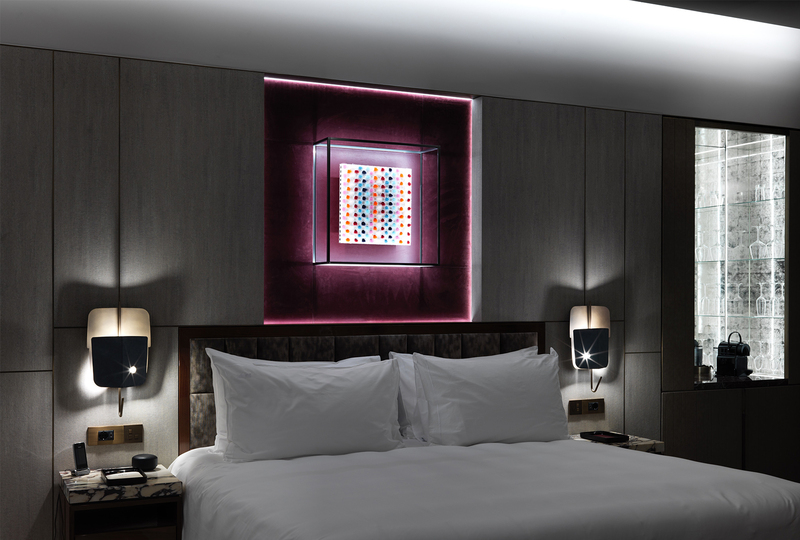 Comprised of just seven impeccably designed suites, the hotel epitomizes a new desire for high-end restraint. 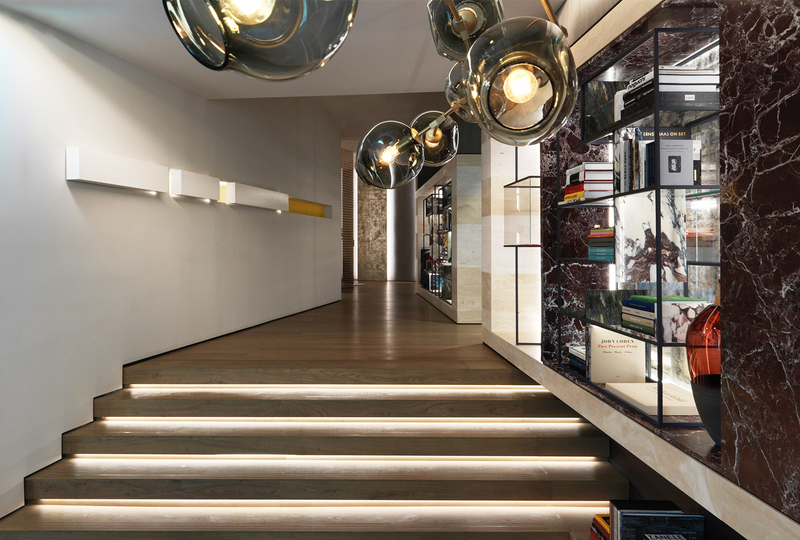 With exclusive access to and emersion into the FENDI world, luxury is redefined for sophisticated customers who are looking for privacy as well as a unique experience in the heart of Rome. 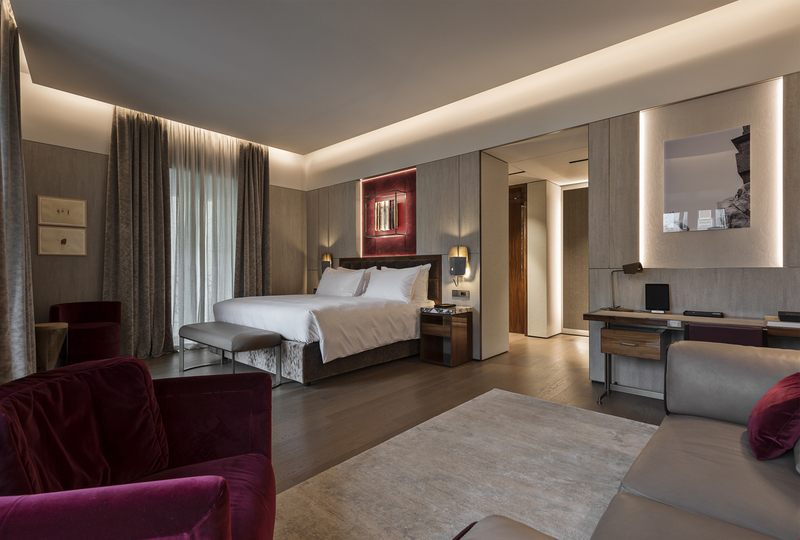 Designed by architect Marco Costanzi, who also designed FENDI’s new headquarters in the Palazzo della Civilità Italiana, the boutique hotel shares many features with other spaces inside the new Palazzo FENDI. 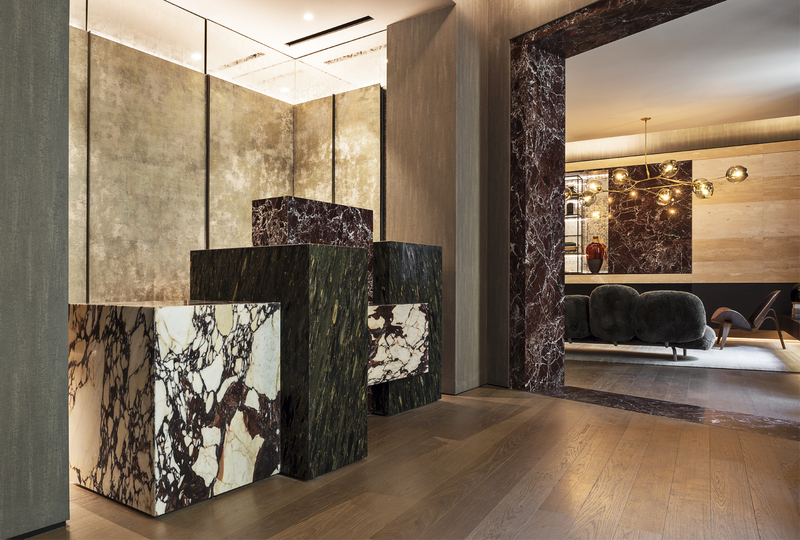 It is accessed from the ground floor of the Palazzo where typical Roman cobblestones have been recreated using the same dark red Lepanto marble as featured in the store’s staircase. A suspended resin sculpture and a vertical chandelier offer an evocative first welcome to guests. 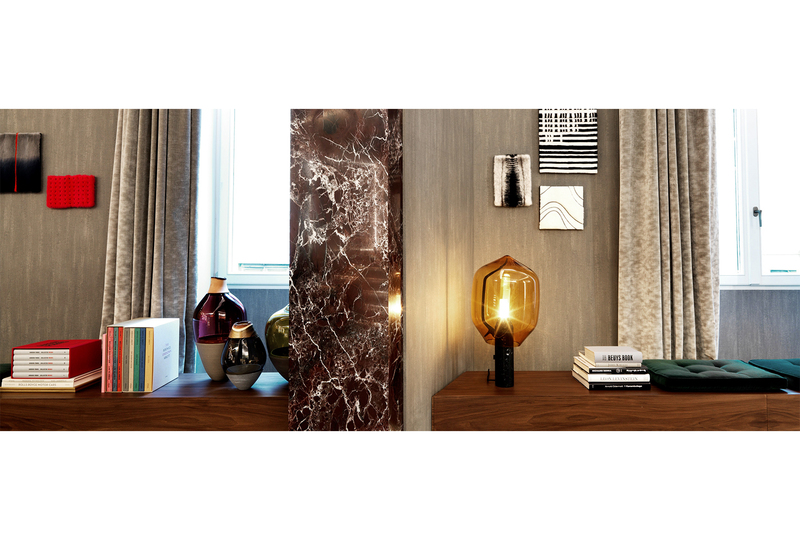 On the third floor, the hotel unfolds like an intimate, well-appointed home. 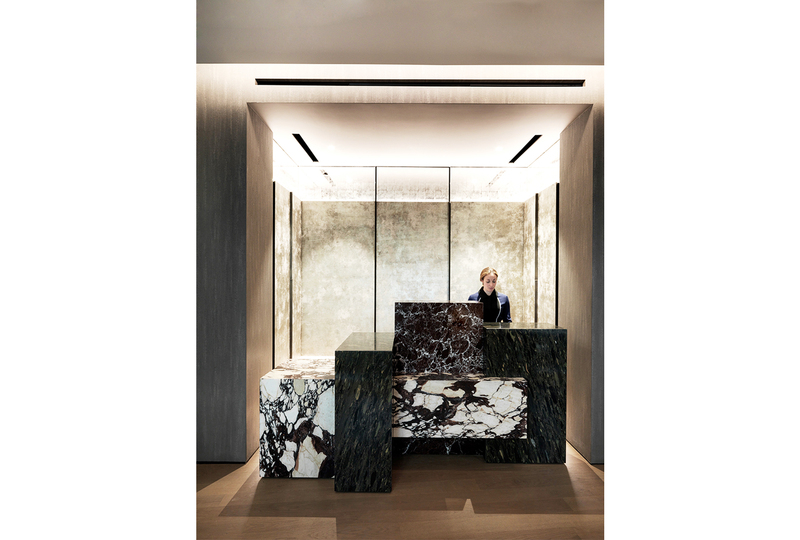 Guests are first greeted by a reception desk created from bold, geometric configuration of colored marble blocks, including white Calacatta, green Favakir and red Lepanto. 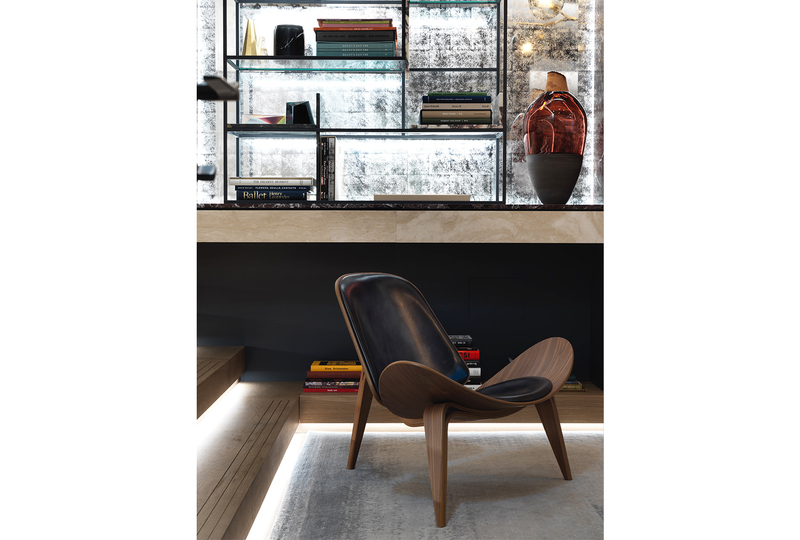 The lounge area feels like the living room of a cozy apartment furnished with a refined selection of important contemporary and vintage design pieces on warm wood floors. A sofa by the Campana Brothers is joined by two armchairs by Fritz Hansen and a suspended glass bulb chandelier by Linsday Adelman. 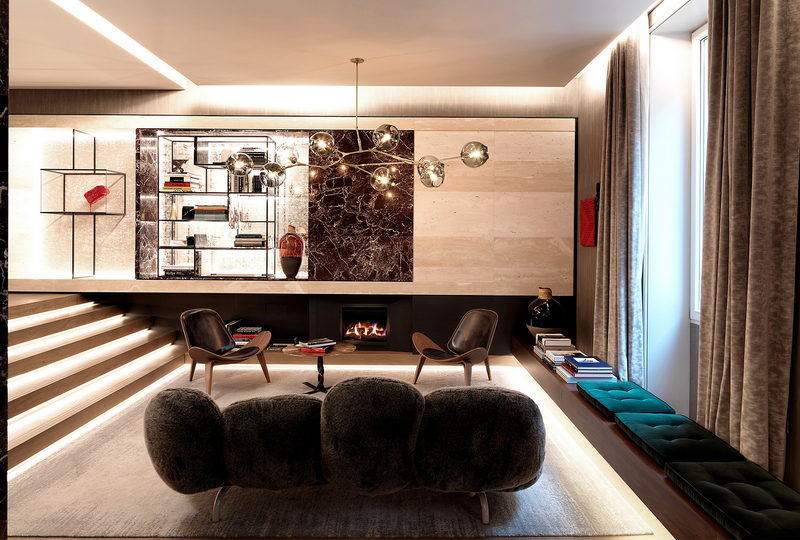 A fireplace and iron bookshelf stocked with coffee table books encourages guests to spend a leisurely afternoon indoors, while FENDI bespoke design pieces warm up travertine walls. A second common area features two velvet club chairs, sofa and a mirror coated with a textured film. Each suite is different because of the historical Palazzo architecture. 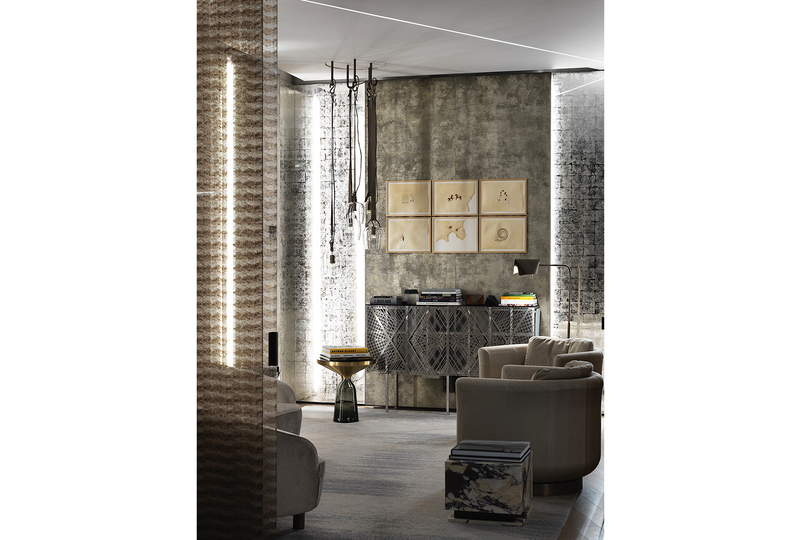 The majority of the furniture has been custom-designed and produced by Fendi Casa, including beds, couches, side tables. But there are several curated items such as glass vases, artwork and Jan Kath carpets that cover the natural oak flooring. 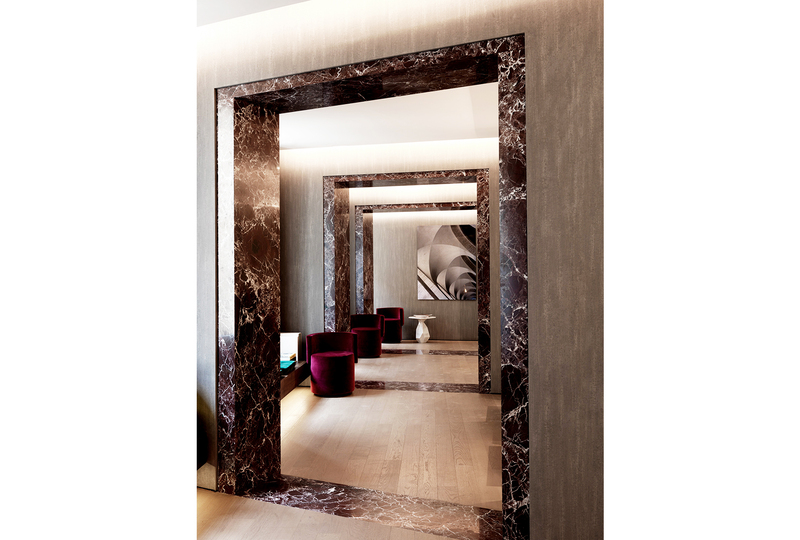 Each room has a Giò Ponti mirror as a touch of classic modern design. 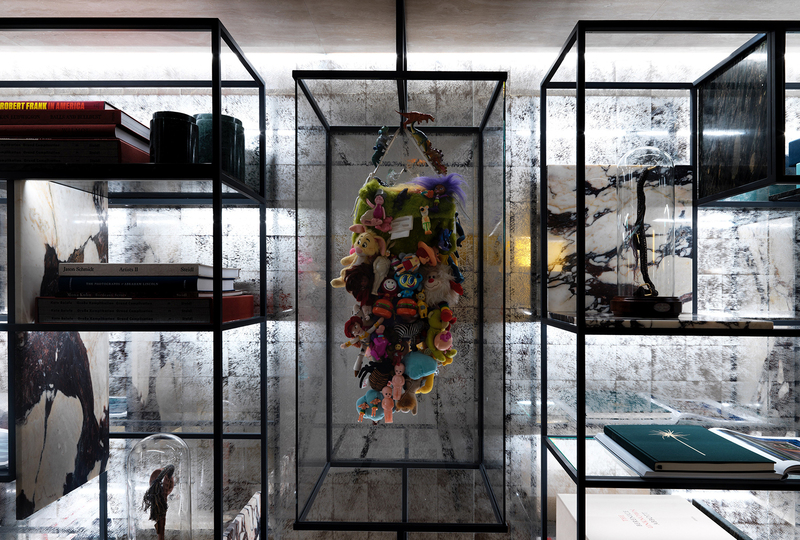 FENDI’s unique fur tablets hang above each bed. 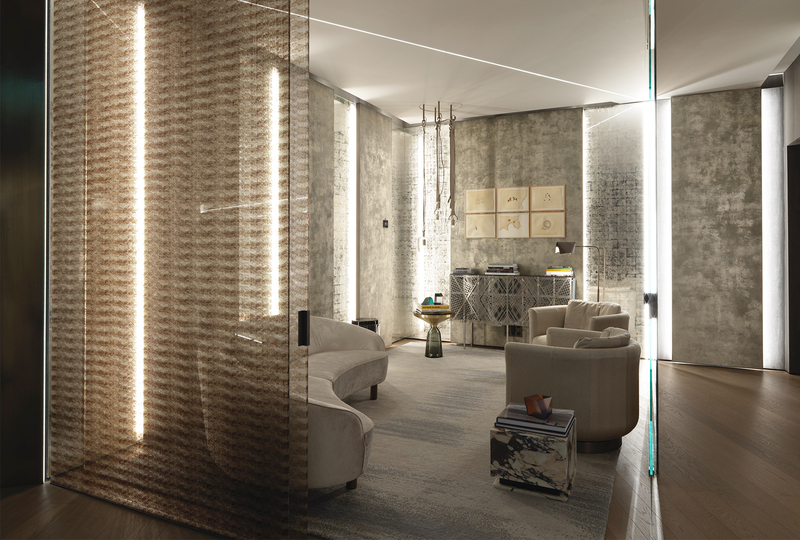 The living areas are divided from the bedrooms with glass panels with mesh frames and wood desks. Reversible televisions can be seen from either the living room or bedroom. 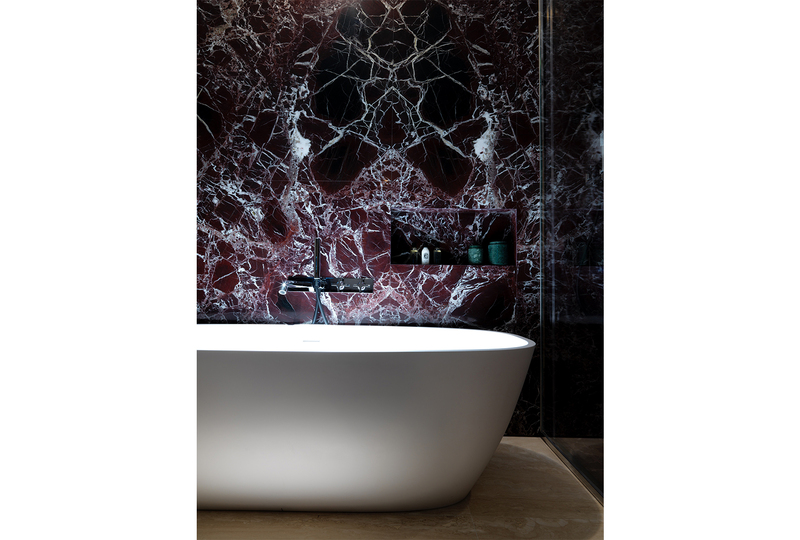 Walls are covered in travertine stone, while the bathrooms are crafted from bold slabs of red Lepanto marble and white travertine. 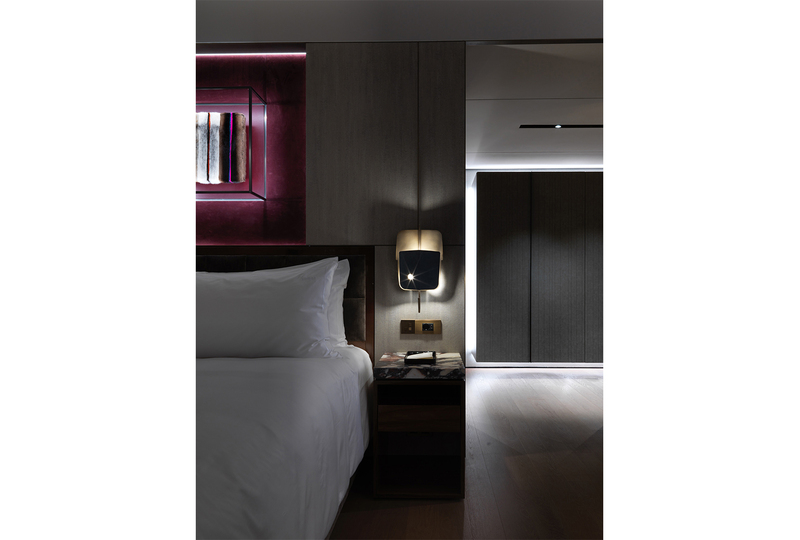 The suites range in size from 35-60 square meters. 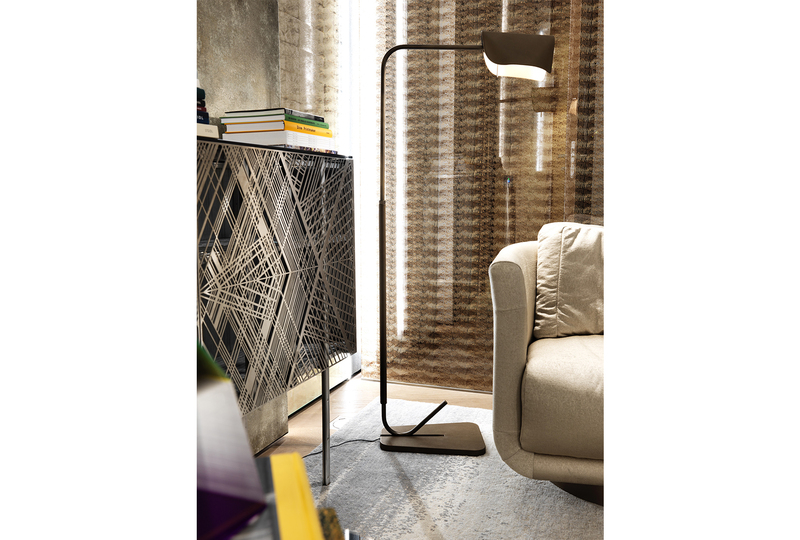 Each features beautiful windows and offers views of Largo Goldoni or streets below Palazzo Fendi. For travellers who require more space, two suites can be enlarged by connecting adjoining rooms.